Perhaps it's the summer of the female singer. 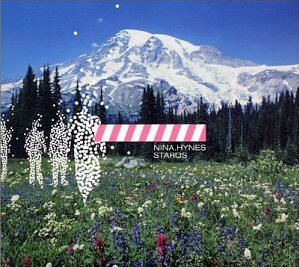 Like Alice walking through a Rathmines Wonderland, Nina Hynes has eventually arrived with her latest album, an early morning take on the self, relationships and - occasionally - the wider world. Having slowly emerged onto the Irish scene, this is Hynes' first full-length release, scripted as an account of where she is from and what she's about. In terms of reference, there are clear echoes of intimate female vocalists such as Nina Simone, Natalie Merchant and Hope Sandoval, while the somnambulistic feel of the music suggests that the singer has paid attention to current home talent like David Kitt and Gemma Hayes. Those who have anticipated 'Staros' on the back of her single release, 'Mono Prix', are likely to be surprised. The eager tempo of that song contrasts with the decidedly slower pace of the record. The twelve tracks on offer are, in the most, contemplative takes on the interactions of man/woman and self/place, all played to a wispy slow beat. Nina Hynes' world seems to be one of slow mornings, lengthy breakfasts and city walks; but at times it sounds domesticated ("life is full of complicated situations hush / I'll bring you tea in the mornings when have to rush / so stay with me when we grow old"), the raw edge of relationship damaged or threatened is ever present, as the voice of 'Staros' insists "I will take you with me when I go?" It is this track, the final one on the album, that best showcases Nina Hynes. Its five minutes are representative of what the rest of the album attempts to achieve. In musical terms, the gentle swell, from Hynes' naked opening vocal to the moody strings at the close, complement the a frantic lyrical appeal to a lover, a cry for re-assurance, that is echoed on 'Dive' and 'Tenderness'. In this case credit must go to producer Dave Odlum, late of the Frames, whose work with Hynes on producing soundscapes parallel to her voice brings forth, more often than not, the right results. Occasionally, on 'Tenderness' for example, a track that would be better served as a stripped, plaintive cry, is instead submerged in meandering waves of effects, diffusing the music's effect. The overall feel of music and voice is that walking in a daydream - objects and emotions sound soft-focused. The ethereal, dreamlike quality of Hynes' vocal is emphasized the most, though occasionally it disappears into the mix to leave the listener stranded, alone on 'Staros' perhaps? Aside from the title track, the pearl-dropped 'Zhivago Blue', where Hynes' wisely uses breath, not voice, and the well-titled 'Last Song of the 20th Century' stand up to repeated listens, the former in particular a good example of the furrow the singer intends to plough for herself. Others, such as 'Shine' and 'Swallow', fall short of this standard. The shortcomings of 'Staros' the album are rarely those of weak songwriting. Nina Hynes certainly has a style, but when it comes to painting a background it's often better to keep things simple, particularly when the vocals, melodies and lyrics demand intimacy. More voice, less noise. But more often than not 'Staros' works, realising the on-stage potential Nina Hynes has displayed. So, if you're feeling intimate?